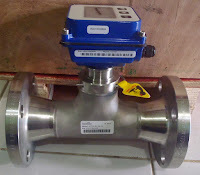 An electromagnetic flowmeter operate on Faraday's law of electromagnetic induction that states that a voltage will be induced when a conductor moves through a magnetic field. The liquid serves as the conductor and the magnetic field is created by energized coils outside the flow tube. Doppler meters measure the frequency shifts caused by liquid flow. Two transducers(one to transmit and the other to receive signal) are mounted in a case attached to one side of the pipe. A signal of known frequency is sent into the liquid to be measured. Solids, bubbles, or any discontinuity in the liquid, cause the pulse to be reflected to the receiver element, Fig. 10. Because the liquid causing the reflection is moving, the frequency of the returned pulse is shifted. The frequency shift is proportional to the liquid's velocity. 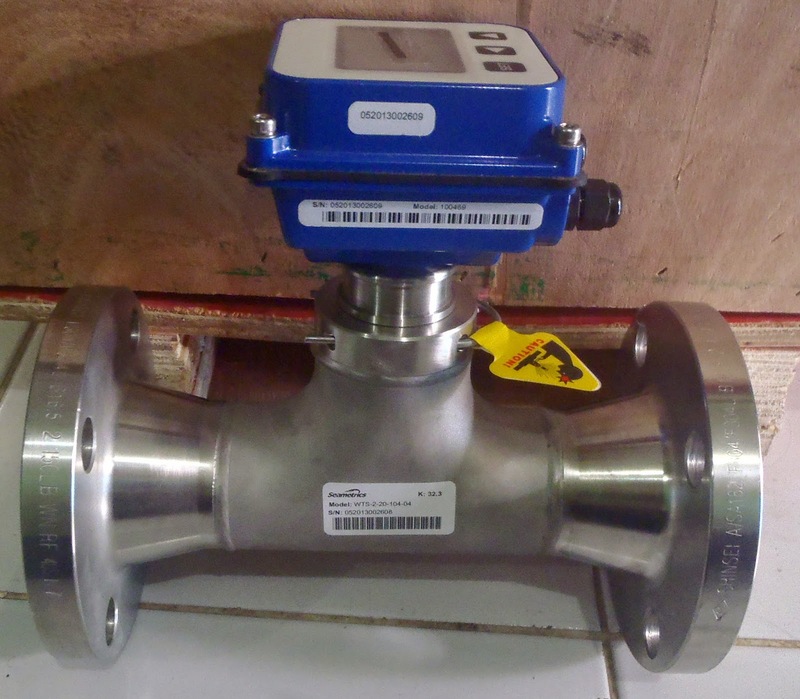 Coriolis Mass Flowmeter series is a mass flow meter that measures mass flow, density and temperature of liquids, slurries and gases. And it even measures oil content in water. It has no moving parts and doesn't require any special device for installation. And it doesn’t require flow profile stabilization by means of flow straightener or straight pipe run either upstream or downstream. The wetted parts are made of high-grade stainless steel (SUS316L) and therefore can be used for corrosive liquids. The mass flow-sensing element is composed of a pair of bent tubes, vibrators and displacement sensors. The trick here is to detect the Coriolis force applied on the tube by the flowing fluid inside the bent oscillating tube. In order to do that, the vibrators vibrate the bent tubes at the natural resonant frequency of the tubes. When there's a flow inside the tubes, the Coriolis force at work distorts the vibration of the tubes. This distortion can be measured using the displacement sensors. The amount of distortion is directly proportional to the mass flow of the fluid inside the tube. By accurately processing the displacement, the accurate mass flow is directly measured. Liquids, slurries and gases can be measured. It boasts strong immunity to noise, high accuracy, wide turndown ratio, stability and reliability.